Today is opening day - unfortunately my quilt hasn't arrived yet (hopefully it comes today!) for me to open, so I thought I would share the quilt I made. It has arrived and been opened. I made a quilt for the lovely Kirsty . As part of the sign up process for the swap, you have to answer set of questions about your likes and dislikes etc. Kirsty had requested a wall hanging, and said she liked Modern quilts, applique, piecing, and most colours except gold. The only things she didn't want on there were ric rak, ribbon, buttons and lace She also wanted to hang it next to a gorgeous green & blue quilt she had received in a previous swap, so it needed to compliment that. I really enjoyed making this quilt. I read a heap of binding tutorials before I finished off this quilt, and I'm thrilled with the lovely even binding I achieved. I tried raw edge applique for the first time - surprisingly quick and although fiddly, quite simple - don't know why I hadn't attempted it earlier! The only things I'm a little disappointed with is 1. the quilting. 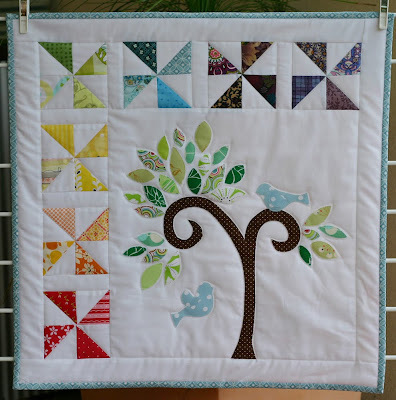 I still haven't attempted free motion quilting, and think it would have looked gorgeous with all the white area around the tree and the border strips in a nice dense swirly pattern and 2. the number of corners I managed to chop off the pinwheel blocks! But in all, Im really happy with the results, and when Kirsty opened it this morning, she said she loved it - and that's the main thing! WOW Nic!! That looks great! I love pinwheels! I love it too, the little blue birds are sweet! Well done Nic, it is excellent! Its absolutely gorgeous Nic, well done! Very sweet little birdies too! got to be in it!